Alan Dorrington and I had a neat little hilly bike ride today over some ace roads on the rim of Calderdale – some of my fave roads in the area. But with a cheeky little twist… we thought we’d ride our ‘cross bikes with slick tyres to see how they felt as road bikes. To an outside there’s little difference between a cyclocross bike and a road bike. Many people actually buy them as ‘all round’ bikes to deliberately ride as touring or commuting bikes. It’s not hard to see the logic – they’re comfortable and a little more forgiving than a steeper angled road bike with more clearance. The modern ‘cross bike has moved nearer and nearer to a road bike with racier geometry and stiffer materials, so it makes sense in a way to give it a go. The first thing I noticed was how far ahead the front wheel felt when riding on familiar roads. It looks and seems a long way away despite the fairly steep head angle on the On One Dirty Disco I ride. This translates in to that bit more comfort on the road. A couple of cm on the wheelbase of the bike – particularly in winter – gives a more forgiving ride. 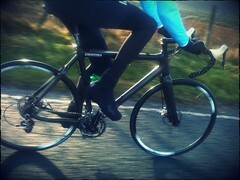 Other than that it felt pretty much like a very responsive and easily controlled road bike. It’s amazing what a hard pair of 23mm slicks can do to the bike that chews up the dirt at the weekends. The improvements in ‘semi’ mudguards also means that mudguard eyelets and stays aren’t needed. My pair of quick ‘snap on’ race guards meant I was ‘comfortably dry’ over the less-than-dry moors and valleys. If I had to own only one bike (tssk… heaven forbid) then it would have to be a ‘cross bike. And forgive my brand lurve, but it would be this ’cross bike.